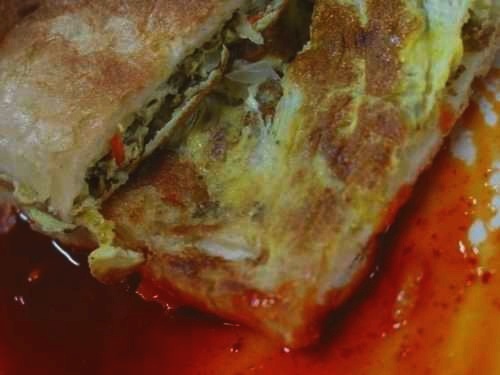 Roti John, essentially an omelette sandwich, is a popular Malay breakfast and snack item in Malaysia and Singapore. There are many versions for roti john. This roti john version uses either mutton or chicken. You may drizzle plenty of chilli ketchup on top of the roti john, mayonaise and mustard sauce! 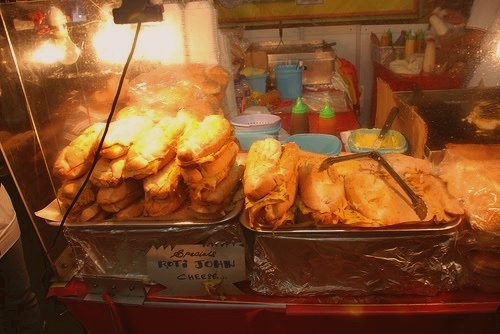 Sold for $3.00-$500 at pasar malam, roti john is also a common dish taken during the month of ramadhan. Fry the minced mutton and chopped onions , garlic , green chillies in a skillet . Sprinkle some pepper . Place into the cavity of a baguette halved lengthwise with the sauce . Then briefly pan-fry the whole baguettes on the skillet by dipping into beaten egg and the spread mixture down . Flip to crisp the other side . Slice into several portions and serve.